Lynda Brennan (New York) is the author of 'Charlie in Fraction City' (2016), 'On my way to Grandma's House' (2015) and 'Miss Penny Says Prove It!' (2014), all are part of the Math MileMarkers series, and published by Math4Minors (USA). We hope you enjoy reading Lynda sharing her experience of working on these incredible mathematical story projects with you! My favorite place in the whole world is the beach. My first book was finished on the deck of a small beachfront hotel in Maryland. This summer, I’ll again head to the shore for some quiet time to write. It’s so peaceful! The main character of my first book, Miss Penny, got her name from my dog. Penny is a very loveable King Charles. When working in my chair next to the fireplace, she nuzzles next to me, often with her nose on top of my computer screen peering down on my every word. It was hard not to make her part of my first story. My latest Math MileMarkers® project, a “Make Ten” game that was produced by Nasco, was illustrated by Stephen Feane. Stephen was a student in my fifth-grade class fifteen years ago. He is tremendously talented, and was fabulous to work with both as a ten-year-old student and as a professional artist. I liked math as a young child, but I certainly did not have the love and appreciation that I have for it today. In school, my instruction was very procedure-driven and a little boring at times. At home, I was given a totally different view. My dad was a structural detailer, working mostly on large bridge projects. At our family dinner table, I can remember several napkins with numbers and doodles surrounding my dad’s place setting. Those same napkins would later make their way to his drafting table where simplistic drawings often became visual solutions for his mathematical calculations. At the very least, my dad’s doodles became the starting point for him to approach a challenge. Today, there is so much more emphasis on the importance of using visual models and structures for problem solving. If you are fortunate enough to experience math through the lens of the Mathematical Practice (MP) Standards, math class can be so much fun. I believe the MP Standards double as lessons on how to be a life-long learner. Great math classes today encourage learners to be risk-takers, and not just compliant problem solvers; to think, draw and ask questions; and to talk about and discuss the math that exists in the world around them. My hope would be that children will learn to see the value in drawing napkin doodles like my dad, and accept mistakes as part of the learning process. I hope that students will confidently seek answers using pictures and models to guide them. The Math MileMarkers® stories lived in my heart and in my classroom long before they lived on paper in a bound book. As a teacher, I always incorporate stories into my lessons to generate interest and connect concepts in a meaningful way. I truly believe that children thrive in learning environments that meet them where they are in their understanding, and offer paths for greater discoveries. Stories engage learners, they visually connect ideas and they make learning fun. I designed the Math MileMarkers® series to be instructional stories. I wanted children to be able to explore math concepts. Above all, I wanted children to have a basis from which they could talk about math, not just do math. One of the most powerful ways to use my stories is to ask students to retell or recreate the story using their own numbers. Retelling is a highly effective reading comprehension strategy, so using it with math stories just makes sense. Let me explain: 'Miss Penny Says Prove It!' is a book about a little boy named Bobby who comes to school with a pocket full of marbles. In seeking to identify the actual quantity, the class explores topics like estimation, quantitative value and multiple counting strategies. 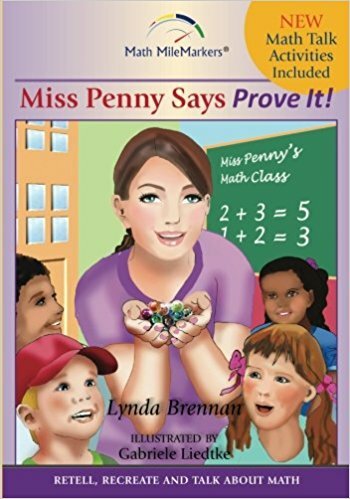 Throughout the book, Miss Penny continually asks students to “prove it!” This prompts great mathematical practices by encouraging students to communicate their understanding of math, and reason about numbers. When students retell or recreate their own version of this story, the lesson leaves the pages of the book and becomes a real part of the child’s learning experience. The child then owns the story, the concepts taught and the vocabulary. Companion activities for all the Math MileMarkers® stories are available to download at www.mathmilemarkers.com. In a picture book, all levels of learners notice something. One small noticing might be the trigger that ignites new knowledge, links prior knowledge or connects a child to a concept as it evolves. Stories give children a unique way to see, to talk about and to explore math. 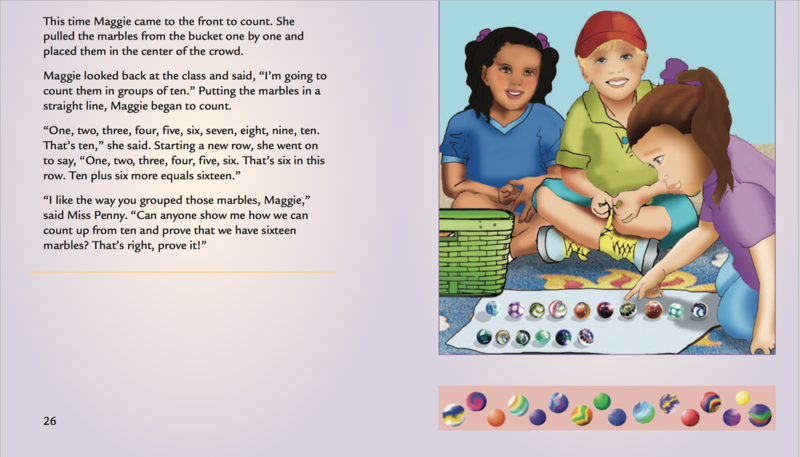 The Math MileMarkers® series were actually designed to be both a children’s story and an educational guide. In the original mock-ups of the product, the book had two front covers. On one side there was the existing picture book cover, and on the reverse side, appearing upside down, was an educators’ guide. Unfortunately, as interesting a concept as this was, publishing and printing text in the reverse format became an impossible task. The Educators’ Guide is still an important component in each of these books. A new version of each title was released that includes the story and a retell, recreate and talk about math with friends activity. Did you ever notice how some textbooks offer a fabricated script that say the teacher will share this thought, and a student will answer in this way? As a teacher, I always found scripted math somewhat odd. I wanted to create a way for mathematical concepts to evolve with pictures. My goal was to have students grow in their understanding by providing opportunities to have natural conversations about the math. ​Do you find coming up with a storyline / context to embed your chosen mathematical concept in difficult? Where do you draw inspirations from? I am inspired everyday by the students, teachers and parents that I work with. When the new Standards were first introduced in the United States, I was working as a math specialist at an elementary school, and at workshops with teachers from multiple states. I heard and understood first-hand the root of the frustrations that surfaced, and it sparked my desire to publish this work. I want people to see the commonality of instruction that exists in the curriculum from kindergarten through fifth grade and beyond. It helps learners make sense of the math. If we can help people understand the constructivist view of mathematics, versus a set of procedures, we will be promoting positive views of math for all. There is a very positive message to share about math instruction today, and many more great stories to tell! 'Miss Penny Says Prove It!' 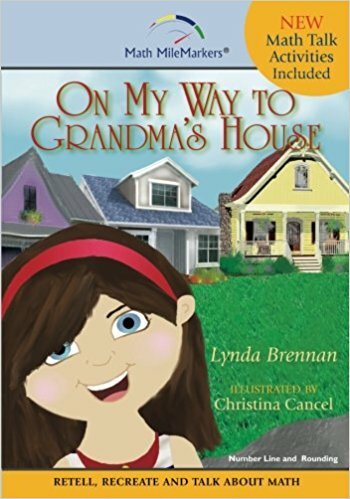 and 'On My Way to Grandma’s House' are both set in real-world settings. 'Charlie in Fraction City' is set in a fantasy world of shapes. For me, it really depends on the content that I am trying to communicate. I want the stories to be relatable for kids, varied in format, but accurate in terms of the math. I think it’s best to mix things up and keep it fun. First, I identify the mathematical message that I want to communicate. The progression documents provide a great framework from which to work. I believe it’s important for people to be aware of how mathematical concepts evolve. Fractions, for example, don’t just appear in the third-grade curriculum. The basis for that understanding begins by students gaining a solid understanding of whole numbers, and how whole numbers are composed and decomposed. Part/Whole or number bond models that are introduced as early as kindergarten are key discoveries worth noting on the learning trajectory for fractions. The Math MileMarkers® series was initially created to support a few speaking events that I was asked to do. My objective was to try to help educators and parents calm, command and conquer the curriculum®. This became my presentation format and the basis for my message to parents and educators. Teacher feedback at various workshops continues to drive my creation and revision process. The illustrations are the very last part of the development process for me. I have used several illustrators. Each book has a very different style. I suspect that I will continue to fine tune the process I use with artists. I cannot tell you how exciting it is to watch my stories evolve from a conceptual level to the finished product. Holding each book in my hand and seeing it appear on Amazon, Nasco and other distribution channels has been amazing. However, I must admit that it has not been an easy path. I continue to learn and grow as an author, speaker and educator every day. It has been a remarkable journey. The most difficult thing for me by far has been finding a way to tell my stories visually. I have used four different illustrators, each contributing something unique in their work. At times, I have had to compromise in picture selections or alter my expectations due to an impending deadline or other constraint. The artists I use need to be a little math savvy to communicate the continuum of learning that I hope to capture. In the end, it’s about the math. In truth, I think I am only at the beginning of this adventure with so much yet to learn. It’s hard to say how long it takes to publish a book. In looking at our release dates, it seems like we are moving at an accelerated pace. The first book was released in November of 2014, the second in 2015 and the third in 2016. My latest project, a “Make Ten” game, hit the market in 2017. How is this possible? As I explained earlier, my stories have been with me for many years. There are several in the works, waiting to be completed. ​When I write, I very often wake up in the middle of the night with a thought and work for a few hours. If I’m lucky, I take a catnap before my 6 a.m. alarm. I can’t really schedule time to write, the writing seems to schedule me. I am very involved with every aspect of the process from start to finish. I work one-on-one with my editor, illustrator and with my invaluable layout designer. Organizing the right team to execute the process has been key. I guess what I am saying is that this series has been a true labor of love. That being said, my measure of time is somewhat blurred. ​When you and your illustrator planned for page illustrations (particularly those that are mathematical in nature), what did you have to consider? 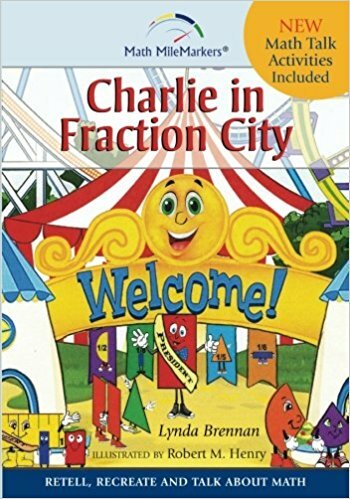 Robert M. Henry, the illustrator of 'Charlie in Fraction City', the third book in the series, grasped the math, the story and more importantly he understood me. He recognized the importance of precision, and was playful in his creation of characters. Robert and I would talk weekly. I appreciated his creative ideas, his willingness to listen and the experience and enthusiasm he brought to the project. I also thoroughly enjoyed working with my former student, Stephen Feane, and being part of some of his first published work. While sitting in a local diner and discussing the project, we joked about how neither of us could have ever imagined this opportunity fifteen years prior. Stephen is a tremendously talented artist and is fabulous to work with. Gabriele Liedtke and Christina Cancel, illustrators of 'Miss Penny Says Prove It!' and 'On My Way to Grandma’s House' respectively, introduced me to their own unique style of art. It is so important to create likable characters that children want to interact with. I think all my illustrators have done that. I am very fortunate to have worked with each of them. The school I have worked in for over twenty years does a fabulous job at celebrating its diversity. I am grateful to be part of that community. Although not directly named, many of my characters have evolved as a result of that positive experience. In terms of male and female roles, my first book had a male lead character, the second a female and the third a rectangle person. Sometimes you just have to mix things up. The mathematical vocabulary and concepts presented are taken directly from the Standards. However, not all the books can be independently read by the targeted students at a particular grade level. 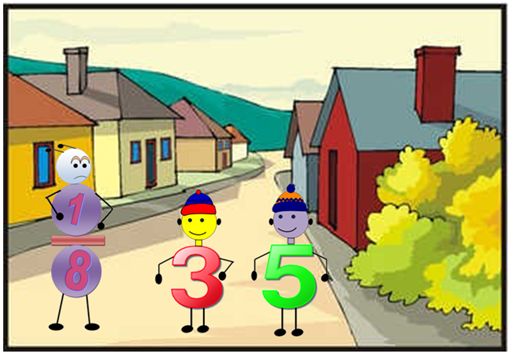 The Math MileMarkers® stories are considered instructional stories. They were designed to be read aloud to students and used to prompt important conversations, including discussions about new vocabulary. The intention is for children to be able to refer back to our picture books, retell and recreate our stories with new numbers and personal twists. They provide a easy way for children to talk about math with their friends. In terms of word count, my audience dictates that. Input from teachers and students is reflected in the text of each story. Updates will be reflected in the new release copies which will be available in September 2017. Yes, there are several titles in the works and new projects and formats that I hope to explore. I welcome new ideas from readers and invite them to reach out to me on my website. I have two beach vacations scheduled this year, a sure sign that writing is in my plans. ​Do you have any favourite mathematical story author(s)? If so, which one, and which aspects of their works do you particularly like? The MathThroughStories.org database has compiled an amazing lists of math story authors. My bookshelves at school are filled with a large collection of their work. I have favorite authors for different grade levels. I have always been a big fan of the work of Marilyn Burns and Greg Tang. I love the way their words, pictures and activities encourage children to think flexibly about numbers. Finally, I also want to mention authors Jane Wilburne, Jane Keat and Mary Napoli, who together published a book, entitled 'Cowboys Count, Monkeys Measure, and Princesses Problem Solve'. This book highlights the value of using picture books to teach math and respects the multiple perspectives that individuals have in their approach to problem solving. The book makes suggestions about how to develop higher-level questions and problem-solving activities that encourage kids to think critically. It reinforces the importance of making stories part of a child’s mathematical learning experience. Apart from being the author, you are also the president of a company that publishes your own books. Is this a blessing or a curse? That is a great question. Before becoming a teacher, I received a business degree and worked in the marketing department of a large corporation in New York City. After many years in the classroom at levels that ranged from kindergarten to college, I became an elementary math specialist at which time my two career paths, marketing and education, seemed to collide. Essentially, I was given the opportunity to “market math” to children, teachers and parents by streamlining resources and information, and presenting them in a way that made math interesting and fun for kids. Math4Minors LLC was developed so that I, and eventually maybe other storytellers and mathematicians, would have the opportunity to share our passion and send a positive message about learning math to children, teachers and parents. Initially, the books were just part of the work I was doing for a set of conferences that I was scheduled to present at. I love how the series and our publishing efforts have evolved into so much more. "Simply put, the key benefit of picture books is that they are a fun way to learn. Picture books motivate and support learners. The visual supports they provide for language development, conceptual understanding of numbers and concepts in math is invaluable. This is especially true for younger learners, and for children who may be new to a language.​"
Simply put, the key benefit of picture books is that they are a fun way to learn. Picture books motivate and support learners. The visual supports they provide for language development, conceptual understanding of numbers and concepts in math is invaluable. This is especially true for younger learners, and for children who may be new to a language. By using reading comprehension strategies like retelling, we reinforce learning practices that make sense in every subject. Because of the visuals, picture books provide an entry point for all learners, regardless of their level. Everyone can notice something in an illustration that will connect them to their own learning. As a bonus, stories prompt “math talk” at home and at school. When students are given the opportunity to create their own mathematical picture books, they are making sense of their own learning. We need to give children multiple ways to both express and experience their learning. For teachers and parents who want to encourage their children to create their own mathematical picture books at school or at home, but are not sure how to guide them through the creative process, what would be your advice? Start with the math! Narrow in on a mathematical concept and imagine you are teaching a friend by leading them through your story path. There are many vehicles for children to capture their creative work. Learn, write, create and share: a perfect recipe for success. Wow, look at how the Mathematical Practice Standards shine when it comes to picture books. Start with the math! Narrow in on a common misconception and build a platform that presents the concept in a new way. There are lots of counting books. What teachers seem to be looking for, especially in the upper elementary grades, are books that allow children to think critically and to exercise their problem-solving abilities. "Teachers love the idea of using stories to teach math. I recently shared information about the work being done by MathThroughStories.org at the National Math Foundation’s Summer Institute. Educators were excited to have access to recommendations for relevant articles, research and mathematical stories. The website truly is a great resource. Best of luck as you continue this wonderful body of work! " MathThroughStories.org has created a tremendously valuable resource for teachers and parents. By organizing picture books by topic, this site has done wonders for ensuring that stories will be part of mathematics instruction and inquiry moving forward. The stories recommended on your site provide a launching pad for great math discourse at home and school. Teachers love the idea of using stories to teach math. I recently shared information about the work being done by MathThroughStories.org at the National Math Foundation’s Summer Institute. Educators were excited to have access to recommendations for relevant articles, research and mathematical stories. The website truly is a great resource. Best of luck as you continue this wonderful body of work! Illustrations copyright © 2016 by Robert M. Henry from Charlie in Fraction City by Lynda Brennan. Math4Minors. All Rights Reserved. 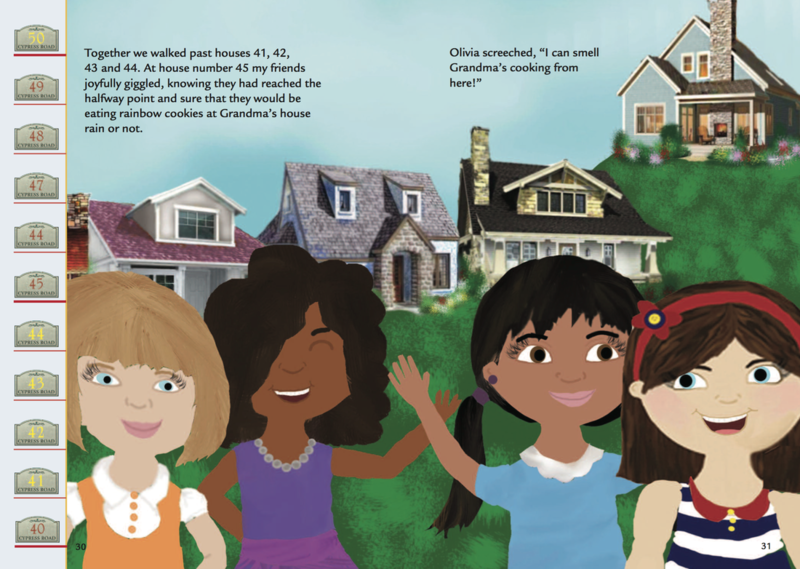 Illustrations copyright © 2015 by Christina Cancel from On my way to Grandma's House by Lynda Brennan. Math4Minors. All Rights Reserved. Illustrations copyright © 2014 by Gabriele Liedtke from Miss Penny Says Prove It! by Lynda Brennan. Math4Minors. All Rights Reserved. Have comments about this interview or Lynda's books?